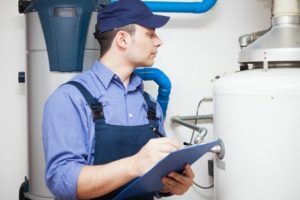 There are actually a number of different kinds of water heater options out there. Which one is right for you? The storage tank water heater is the most common and recognizable type. The tank itself is insulated and will store and heat water until you use it. It works with a temperature- and pressure-relief valve that will open if either goes beyond a preset level. The water is released from a pipe located on top of the tank. With a tankless water heater, there is not actual on-location water storage. This system uses heating coils that heat the water when you need to use it. Although this option is more energy efficient than the storage tank, the drawback is that you’ll only be able to access a limited flow of hot water per minute. This system will best serve people with small families or that live alone as you likely won’t be drawing water for more than one use at any given time. They are also best for home that use natural gas. The heat pump water heater is also known as a hybrid water heater. It works by capturing heat from the air and transferring it to the water. The drawback with this model is that it is more expensive than electric-only models. However, the hybrid water heater uses 60 percent less energy. These are also the most efficient in spaces that remain within a range of 40-90 degrees Fahrenheit. This system also requires a floor to ceiling clearance of about seven feet because the heat pump is located on top of the tank. In the same manner that solar panels provide energy to your home, the solar water heater absorbs the sun’s heat to heat your water. The system will be mounted on the roof and cells transfer the heat into an antifreeze-like liquid. This system works the best in warm and sunny climates but the savings in your energy bills will suffer on cloudy and cold days. If you choose this system, you’ll likely use a backup. For those that use gas to heat their homes and require a capacity of more than 55 gallons, the condensing water heater would be the right choice. It features a tank like in the storage tank system, but captures gases that are normally expelled to be cycled back through a coil that warm incoming cold water. This entry was posted on Friday, November 16th, 2018 at 10:16 am. Both comments and pings are currently closed.